Happy Tuesday! Time for another fun challenge over at Tuesday Throwdown. This week's sponsor is Bugaboo Stamps. October is Breast Cancer Awareness month so I chose this fun Vivan image to use. The image is colored in using Copic markers. I used a Spellbinders die for the gray polka dot paper. Popped the image on top using 3-D foam tape and finished it off with rhinestone brads and pink organza ribbon. Please join the TT team over at the blog for more awareness projects and enter to win some fun prizes from Bugaboo Stamps. Such a cute image- love the black shoes she is wearing! 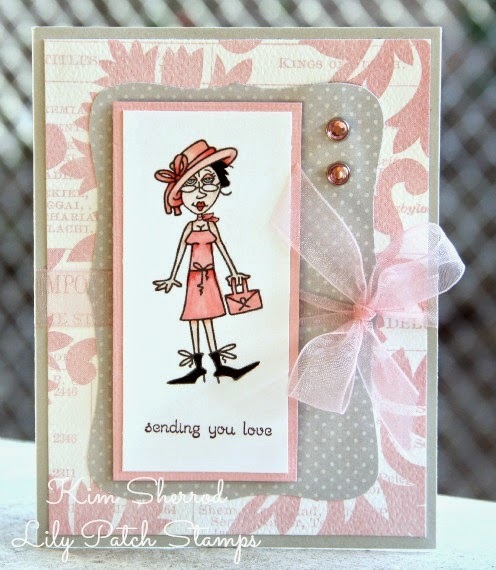 Your coloring is so soft and pretty- love the DP and the polka dotted gray DP is a fun touch! Love all the sweet pink on this one and it looks fantastic with the gray color. Cute card and so very pretty. Oh what a pretty card. I love the soft colors here. Love the image too she is adorable.